Every year, members of CCEDNet – Manitoba gather to create a pragmatic, wide-ranging and solutions-focused set of public policy resolutions to strengthen their work and address issues related to poverty, social exclusion and fair economies. These policy resolutions address either the basic needs that allow communities to participate in CED activities (such as access to housing and child care), or specific areas of CED activity, such as education and training, social enterprise, or housing co-operatives. We are proud to present this year’s set of member-endorsed policy resolutions. Passed by our member in November 2015, these policy resolutions will update our policy mandate, and present new opportunities for CCEDNet – Manitoba to engage with our partners in the provincial and municipal governments. Some of the resolutions are updated from the previous years, such as 2016 – 2 Poverty Reduction Plan & Legislation, while others are new policy concepts and areas of work, such as 2016 – 5 Investing in Community Safety, Stability & Prosperity. 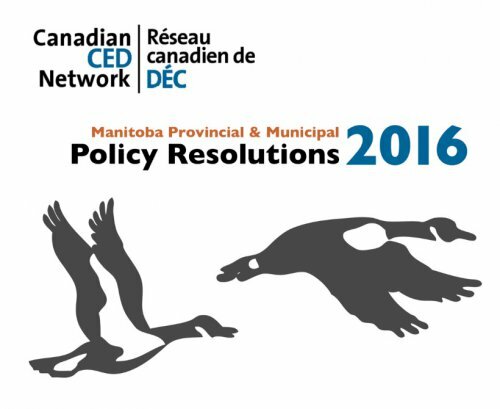 In the new year, CCEDNet – Manitoba will work with its membership to develop an action plan for the new policy mandate. We look forward to working with various levels of government and departments to create a policy environment that is conducive to our membership’s work of building fairer and stronger local economies, reducing poverty and homelessness, and creating more sustainable communities.